4/26/19 and 4/27/19 Times vary. There is no fee for any BioBlitz activities beyond LLELA’s normal $5/vehicle entry fee. However, many of the hikes have limited space available and will require a ticket. Tickets will be distributed at a registration table at the event on a first-come, first-served basis…so come early if there are certain hikes you definitely want to join. A few after-hours events do require pre-registration, noted below. Contact Lisa Cole at 972.219.3550 or lcole@cityoflewisville.com if you have questions about the BioBlitz. LLELA is also seeking volunteers to assist hike leaders in recording data (one for paper log, one for iNaturalist) for each activity below, so let us know if you’d like to help! 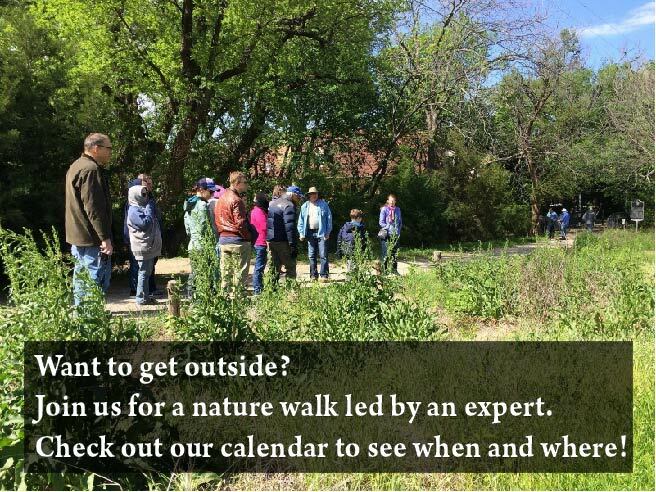 2-4 p.m. Cross Timbers Forest Ecology Walk led by Master Naturalist Rich Jaynes. Meet at the Visitor Center. No pre-registration required. 6:30-8:30 p.m. Bat acoustical survey with Environmental Consultant Ryan Blankenship. **Pre-registration required, contact lcole@cityoflewisville.com. 6:30-8:30 p.m. Frog Walk with Master Naturalist Scott Kiester. **Pre-registration required, contact lcole@cityoflewisville.com. Migratory Bird Banding Observation: 7:30-9 a.m. or 9-10:30 a.m. 10 tickets per session. Get tickets at the registration table. Tickets are first come, first served. Meet at the river parking lot. Bird Walk: 7:30-10:30 a.m., led by master birder Sue Yost. 30 tickets. Get tickets at the registration table. Tickets are first come, first served. Meet at the Pavilion. Wildflower Walk, with Master Naturalists Irene Hanson and Becki Bertoni. 9-11 a.m. 15 tickets. Get tickets at the registration table. Tickets are first come, first served. Meet at the river parking lot. Reptile and Amphibian Walk, with herpetologist Stephen Aroussos. 9-11 a.m. or 1-3 p.m. 15 tickets per session. Get tickets at the registration table. Tickets are first come, first served. Meet at the Bittern Marsh Trailhead. Butterfly Walk, with Master Naturalist Melanie Schuhart. 10 a.m.-noon. 15 tickets. Get tickets at the registration table. Tickets are first come, first served. Meet at the Pavilion. Dragonfly Walk (tentative), 1-3 p.m. 15 tickets. Get tickets at the registration table. Tickets are first come, first served. Meet at the Bittern Marsh Trailhead. Spider Walk, with Fort Worth ISD’s Matt Rose. 2-4 p.m. 15 tickets. Get tickets at the registration table. Tickets are first come, first served. Meet at the Visitor Center. Bring Me a Bug, with Master Naturalist Laura Kimberly. 12-3 p.m. No tickets required. Stop by the Pavilion to pick up a net and an insect keeper and explore the Pollinator Garden and adjacent prairie restoration area. Laura will help kids of all ages identify their finds and record them in iNaturalist. Pond Bug Sorting, with UNT biology graduate students. 10 a.m.-3 p.m. No tickets required. Check out what the students found in their morning wetland invertebrate sampling. Dragonfly nymphs, snails, water scorpions, and more! They’ll be in the Pavilion. Kids’ Corner, 9 a.m.-3 p.m. in the Pavilion. No tickets required. Animal tracks, mammal skulls, homemade bug houses, and more. 8 p.m.-12 a.m. Bugs in a Blanket (night insect survey at lights) with TPWD’s Sam Kieschnick. **Pre-registration required, contact lcole@cityoflewisville.com. Contact Lisa Cole at LLELA to find out what volunteer opportunities are available. LLELA will also be open ($5 per car) for general City Nature challenge photography and observations.